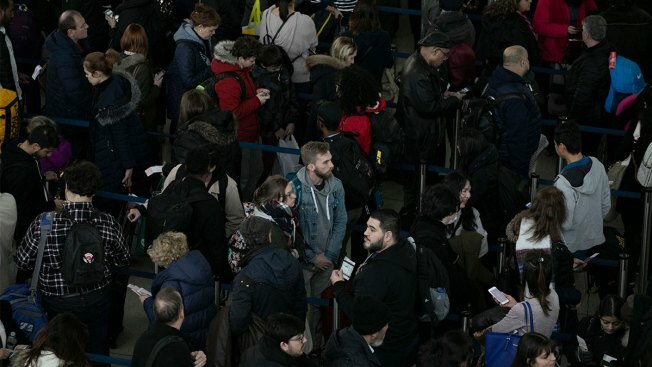 Passengers wait in line, Monday, Jan. 7, 2019, at New York's John F. Kennedy International Airport. Senate Minority Leader Chuck Schumer, D-N.Y., suggested Sunday that the partial government shutdown is disrupting Transportation Security Administration operations. Transportation Security Administration screeners at U.S. airports are facing their first missed paychecks as an impasse between President Donald Trump and lawmakers over funding for a new barriers at the U.S. border extends what is already one of the longest-ever government shutdowns. On Wednesday, talks broke down with Trump, House Speaker Nancy Pelosi and Senate Minority Leader Chuck Schumer, broke down. Trump called the meeting "a total waste of time." The some 51,000 TSA officers have been working without an idea of when their next paycheck would arrive since the shutdown began on Dec. 22. Airport representatives and air traffic controllers are fretting about the prolonged closure. "Federal staffing and other resource shortfalls brought on by this shutdown threaten existing and new air service to communities across the country, harming air travelers, businesses, and regional economies all over America," the Airport Council International trade group wrote in Jan. 8 letter to Trump, Pelosi and Senate Majority Leader Mitch McConnell. "A true national crisis would develop if we cripple the U.S. aviation system in this manner." Airlines for America, a trade group that represents several carriers, including American Airlines, United Airlines and FedEx, said that some companies are already seeing the impact from the shutdown "specifically regarding certification of new aircraft and the implementation of new training programs for pilots, as well as training for air traffic controllers and other aviation employees." Air traffic controllers and flight attendants are scheduled to protest the shutdown near the Capitol in Washington on Thursday afternoon. The TSA workers are among the roughly 420,000 federal employees deemed essential who must work through the shutdown, but without pay. That also includes more than 14,000 air traffic controllers. "It must end," Doug Church, a spokesman for the National Air Traffic Controllers Association, the union that represents more than 14,000 U.S. air traffic controllers, said of the shutdown. "Aviation is not a political issue." The TSA acknowledged that slightly more TSA officers were calling out sick this year than last year but said it was not disrupting air travel. "There has been no degradation in security effectiveness and average wait times are well within TSA standards," the agency said in a statement. "We are grateful to our officers for continuing to carry out the mission of securing the transportation system during this period." Some of the workers are preparing to miss at least one paycheck. "No one wants to miss a check. One is too many," said one three-year TSA officer at LaGuardia Airport who asked that his name not be used because he was not authorized to speak to reporters. He said he would use savings to pay rent for the apartment in Queens he shares with his parents. Another officer at LaGuardia said his landlord in the Bronx is allowing him to pay his rent late and "has been understanding." He said it is more difficult to negotiate with his credit card and cell phone service. He said he is not planning to quit the TSA but said he would consider getting a side job to make ends meet.